Catalog Home > Designer Cut-Outs, Sticky Notes, 6"
Designer Cut-Outs, Sticky Notes, 6"
These versatile Sticky Notes 6" Designer Cut-Outs feature a rainbow of brightly colored sticky notes - red, orange, yellow, lime green, turquoise, and purple. 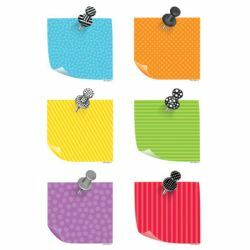 Each sticky note is patterned with polka dots or stripes and accented with a stylish push pin to create a colorful, modern look. Perfect for use on bulletin boards in a wide variety of classroom, office, church, and school settings. They are also great for classroom organization and labeling.